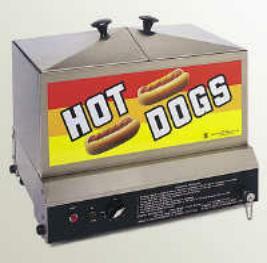 Hot Dog Steamer Operation Instructions and Specs. Width: 19" Length: 15.5" Height: 16" Weight: 30 lb. 1. Make sure the steamer is placed and operated on a flat , level surface. 2. Make sure to plug in to a dedicated line with the specifications above and that no other appliances are on the same circuit. ON/OFF SWITCH : Turns on the machine by supplying power to the heat element. HEAT CONTROL: By Adjusting the knob up or down, the heat control will adjust the temperature of the steamer. 1. Remove the two lids from the top of the machine. 2. Remove all baskets and partitions from the interior of the machine. baffle rests on. DO NOT fill above the ledge as the cabinet will leak and the hot dogs will be sitting in water. 4. Replace all partitions and baskets. is free circulation of steam. 6. Turn the power switch to the "ON" position and set the heat control to the desired temperature. 7. Keep the doors closed when not serving. 8. Add water when necessary to maintain water level. The machine can take up to 2 hours to steam a full load of hot dogs, to speed up the process pour hot water instead of cold. Once the hot dogs are fully cooked, lower the temperature setting to prevent overcooking.